Exciting times in our little corner of Cape Breton. The new shrimp processing plant, Premium Choice Shrimp, has started production. We’ve been busy on a number of contracts for this client including the integration of a CMMS (Computerized Maintenance Management System), IT consulting and training, PLC (Programmable Logic Controllers) programming and troubleshooting, and our main project, the development of a customized Production Management System. 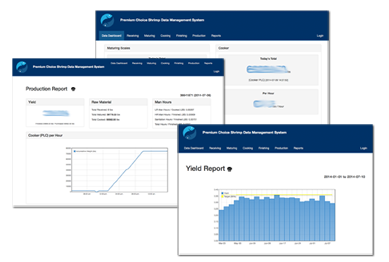 The Premium Choice Shrimp Production Management System combines user friendly reporting with the automated extraction of data from various points throughout the process including PLCs and scales. This data is then used to provide management and staff with a realtime snapshot of production. The information from these snapshots allows the production team to identify problems and correct them in a timely manner. The system also improves communication among all employees. The historical data is presented in various reports which improves traciblity of the product and is used for the analysis of key perfomance indicators (KPIs). The system is still under active development.